After a little over two weeks away from the office, I’ve been in my usual post-holiday slump since we got back home on Sunday. I try to tell myself that it’s only because I spend 48 (or so) weeks of the year at work that I appreciate time away from it quite so much but on days like today, I’m pretty sure that I would be happy to stay on holiday forever. I’s going to take industrial quantities of chocolate chip cookies to get me through this week. Kamut is the better known brand name of khorasan wheat, an ancient variety that is thought to have been first grown for the pharaohs. Like einkorn and spelt, the flour contains far more protein and nutrients than regular flour and it has a rich and butter-like flavour that makes it particularly good for baking (plus it contains gluten making a straight substitution fairly easy). 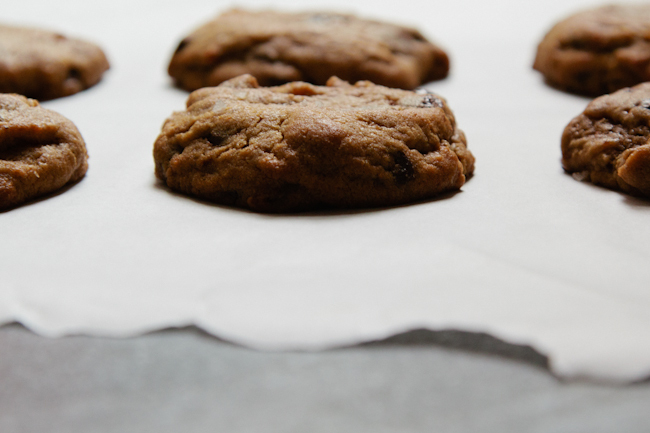 In combination with the caramel-sweetness of coconut sugar and maple syrup and the bitterness of the dark chocolate and coffee in the dough , it creates a really quite superior chocolate chip cookie. I played around with the quantities of dry/wet sweetener and I think this is about my favourite ratio. The coconut sugar gives more of a structure to the cookies and without it, they tend to flatten and crisp. The combination of the kamut flour and the liquid sweetener do make for a fairly soft cookie e (especially if you under bake them a little) which makes them perfect for ice cream sandwiches. 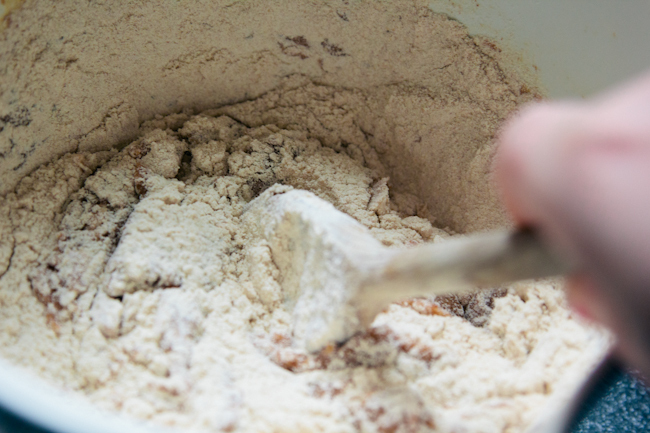 In a large bowl, whisk together the flour, baking powder, bicarbonate of soda/baking soda, salt and coffee and set aside. Cream the butter together with the coconut sugar and maple syrup until combined. Add the egg and vanilla and beat again. As this isn’t a recipe for a cake, you don’t need to keep on beating forever – you just want everything all nicely mixed together. You can do it by hand if you want although I used my electric mixer. Fold in the dry ingredients, followed by the chocolate chips. Chill the mixture in the fridge for about 2 hours. Preheat the oven to 180C/350F and prepare a couple of baking sheets with either greaseproof paper or a silicone mat. Using an ice cream scoop or a cookie scoop, place spoonfuls of the dough on the baking sheet and, if desired, scatter a little sea salt on top. Bake for 8 – 10 minutes until the edges of the cookies just start to turn golden brown and are firm to the touch. Allow to cool on the baking tray for 10 minutes before transferring to a wire rack. 2 Responses to "kamut and maple syrup chocolate chip cookies"
I have a bag of Kamut flour so I am going to give these a whirl at the weekend. I usually bake Kamut bread (loaves and rolls) so it will be interesting to make biscuits instead and see how they turn out. Thanks to Google for bringing me to your recipe! These are very tasty. Mine came out a bit dry but that’s probably due to my recipe substitution of Lucuma instead of coconut sugar and a bit less chocoloate. I will definitely make these again and probably use a yacon syrup – lucuma combo so it’s not so powdery and requires so much mixing. I’ve read that kamut should not be “mixed” too much or it becomes dry/crumbly.